"I'll stand right here, thank you." 21 Grams is a movie that moves and shakes us farther than we enter the theater prepared to allow. Like any good character-driven film, the engagement comes in getting involved and caring about the characters we spend two hours coming to know instead of the explosions and side-splitting laughs. Those are not in this movie. Raw human emotion and basic truth is. Sean Penn plays a middle-aged mathematician in immediate need of a heart transplant. Benicio Del Toro is a Bible-toting ex-con trying to put the pieces of his family back together again. Naomi Watts is a recovering drug addict making it through the rough patches because her two young daughters need her. And like so many great films do, these seemingly unrelated characters come together in ways that make their conclusive relationship seem as though they were inevitable from the beginning. The film opens on a shot of Sean Penn and Naomi Watts after a night spent together. Naomi is asleep and Sean Penn is smoking a cigarette as though every inhalation is a blessed gift to be savored and forever remembered. Then the screen goes black and 21 Grams appears at the lower right corner of the screen. The tone is set and the movie commences. The film is told in a non-linear web of events that eventually tie together to tell a story about revenge, hope, love, redemption, forgiveness, faith, and all the best concepts few other films attempt to take on all at once. Alejandro Gonzalez Inarritu, director of the Academy Award nominated Amores perros, and writer Guillermo Arriaga, the writer of the aforementioned film, both know how to juggle the themes and the unique and jarring characters with ease. The film flows in and out of moments that are alternately unnerving, shocking, endearing, unbelievably sad and mind blowing. Still, it is paced and carried out so that it leaves no audience member behind. I myself felt desparately lost at times, but the movie pulled me in and kept me captivated until I could ultimately leave the theater with the best film going experience I had of any film released in 2003. The non-linear story telling makes the story difficult to follow, making time seem locked away in a trunk with the director now controlling what we see and when we see it. The brokenness can be related to Memento, the indie favorite from a few years ago, but that film was told in reverse with black and white segments interrupting the action. 21 Grams is more like a puzzle dumped face up out of its box: we see one piece at a time and when the audience puts them together, we see the full picture. The performances are all top-notch, career-defining performances. Sean Penn is more restrained and subtle than he was in his Oscar nominated role for the excellent Mystic River. 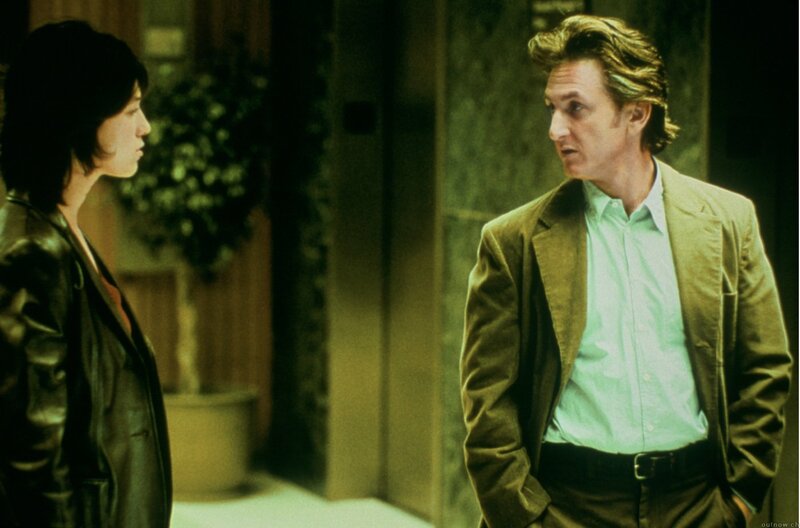 I think I appreciate Penn's work in 21 Grams more than Mystic River simply because of the remarkable ability he showed as Paul Rivers that he couldnt show in all the other movies that I saw him in. From Casualties of War to I am Sam and Mystic River, Penn has been wowing us with heart-wrenching scenes that illuminate the screen. His whispering and gently spoken consolations in 21 Grams appear to make him work harder than any of the performances I have seen since The Thin Red Line. While I will be rooting for Penn come Oscar night, in the back of my mind, I'll be wishing he had gotten recognized for 21 Grams. Naomi Watts, of whose other films I have only seen The Ring, is astonishing as Cristina Peck. I watched spellbound as she transformed from a grief-stricken widow into a revenge-hungry woman on the edge of decency. Much has been made of the Watts' willingness to go without make up and be less than glamorous, but thats a bunch of hoopla. She still is beautiful and alluring. The feat is that none of this takes away from the emotion that she presents openly as it occurs. In one smooth swoop, Naomi Watts has become the actress I am most eager to see in a film again. Benicio Del Toro doesn't match his amazing, Academy Award-winning performance in Traffic, but he does do a great job in a role that asked more of him than any other actor could deliver. We intermittently cheer for and loathe his character, and I think it was wholly intentional. Much like with the other main characters in the film, we change our alliance with him as often as he changes emotions. The storytelling brilliance and accomplishment by Del Toro that will stay with me is that the character of Jack Jordan feels the same way about himself as we feel about him, and the esteem is ever changing. Another little-talked-about strength of this powerful film is its incredible supporting cast. Even when a supporting character only delivers four lines of dialogue or reacts to a main character reacting, they raise the quality and emotion of the film. Clea DuVall, Melissa Leo, Charlotte Gainsbourg and Jerry Chipman all make noteworthy contributions to 21 Grams with screen time ranging from a few minutes to an hour or more. 21 Grams earned two Oscar nominations, a admirable feat for any film, but I cant help but feel the film has been slighted. For a director to steer the audience through such a maze of time, emotions, and themes is worth at least a nomination. Yet, Alejandro did not receive such an honor. One of the many revelations I discussed with friends after the film was how little we understand about tragedy until tragedy occurs on a personal level. One of the things I love most about films: when you still talk about it on the way home and days after. Now that's something.